Spring in the Ozarks is truly magical. Nearly 1.2 million acres come to life after winter’s rest. Explore some of the 340 miles of shoreline of Greers Ferry Lake. Follow the eagles as they soar above the 1.2 million acre Ozark National Forest. Experience the burst of color with the blooming of the Spring Dogwoods and Red Buds, indigenous to the Ozark Mountains, during a scenic driving tour. Or consider a hike and bike on more than 30 miles of newly developed trail system. Or how about playing a different type of golf this Spring at the Disc Golf Course, or try Foot Golf. ‘Adventure Out’ to explore the new wonders of nature, or ‘Blossom In’ for some indoor learning. The choice is yours! 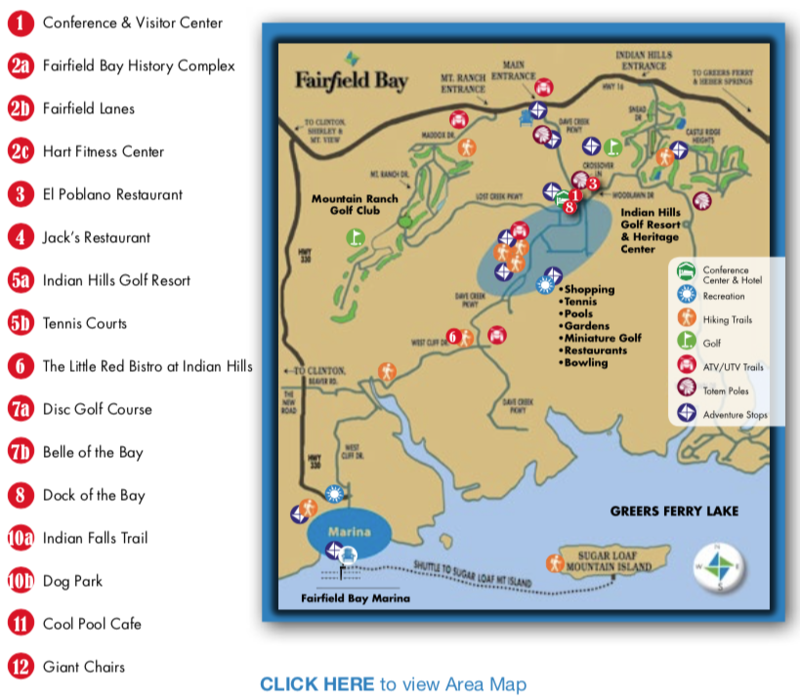 Today, begin your stay with a bit of history while you’re learning about Fairfield Bay’s past. Enjoy the color and bloom one only feels on a fresh spring morning. Check out our other great 36-Hour adventures. Come take a BayVenture in Fairfield Bay. 1. Conference, Arts and Visitor Center 1 p.m. 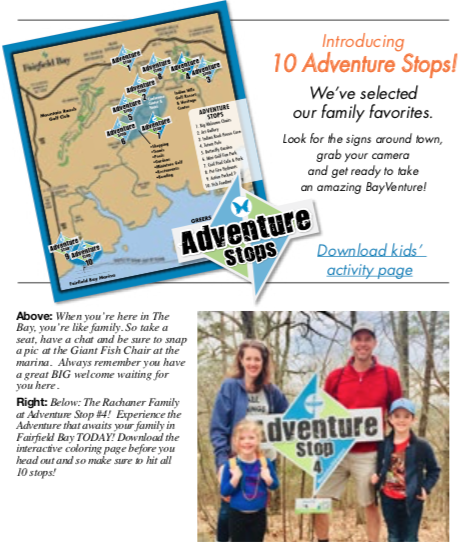 Consider the Fairfield Bay Conference & Visitor Center your landing pad! Recently renovated, the Center is a conference, performing and visual arts center all in one, as well as your home base for information. Relax in the lounge or outside on the deck. Pick up some area information and maps, and get acquainted. Step into the North Central Arkansas fine arts gallery, featuring works of stained glass, paintings and sculpture; many of these one-of-a-kind pieces are available for purchase…what a perfect souvenir! Ask if “Our Towne Productions” has a theater show during your visit. You’ll be planning your next visit before you even start this one; if you aren’t in town for one of the many festivals or celebrations, we bet you’ll want to return. As tough as it may be, tear yourself away from the beautiful Center and head toward your next adventure in Fairfield Bay. Fairfeld Bay’s Conference Center host community events, plays, concerts and is a perfect place to plan a reunion, wedding or conference. Your home base for community information and things to do. The historic Log Cabin Museum, built in 1850, replicates a home and life in the Ozarks of the 1880s. You’ll find one of the three hand-carved totem poles close to its front door! Free admission. 2a. Adventure Out: History & a Hike 2 p.m.
Start your FFB adventure at the Bay’s history complex, located adjacent to the Indian Hills golf course, and features a museum, cabin, and historic Indian Rock Cave. Learn about the history of the area in the museum and imagine life in the 1800’s era cabin. If you enjoy totem poles and the stories they tell, you’ll find the first of three poles in the Bay right next door to the museum. This pole was hand-carved out of native Arkansas Red Cedar by local woodcrafters. See if you can find the Liberty Bell, Statue of Liberty or the Bill of Rights! Follow the wooden stairs to the legendary historic Indian Rock House – a huge natural structure that served as a tribal meeting place as far back as 1000 BC. Look for petroglyphs and imagine living in the shelter of this natural wonder. The cave has been the setting for modern day weddings and a golf cart drive-in movie during summer! If the trail beckons, follow it as it meanders among rock formations on the bluff. 2b. Blossom In: Springtime Inside Options 2 p.m. If a springtime shower interrupts your outdoor plans, hop over to Fairfield Lanes and bowl a few frames. Pool tables and video games can round out your entertainment, as well as some treats from the snack bar. Or grab a day pass for the state-of-the-art Hart Fitness Center. Work out with weight machines, walk the track, or pick up a game of hoops on the basketball courts or a game of pickleball with some hardy locals. The indoor heated pool is the perfect place to get reinvigorated. And of course, top it o with a sauna or hot tub! 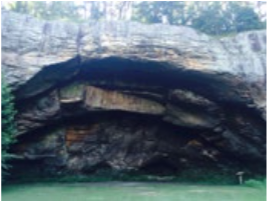 Indian Rock House Cave is a natural wonder and takes you back in time to where trial Indians met. On the national historic registry, this 1,000 year old natural sandstone grotto houses petroglyphs and offers a nature trail with boulders and hidden crevices. 3. Dinner & Don’t Forget the Dessert 6 p.m. Finish your day with dinner at one of The Bay’s eight fantastic restaurants. El Poblano is a favorite with locals who say there’s no better Mexican food in the area. A full listing of restaurants can be found here. After dinner, take a walk around beautiful Ed Leamon Park. This award-winning garden, created by the Van Buren County Master Gardeners, features a rose and butterfly garden, walking paths, water features and offers some nice photo opportunities. 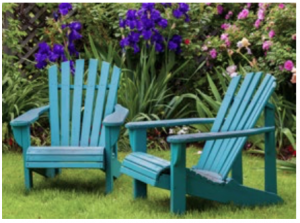 If you see someone digging…ask them for a garden tour. They’ll be delighted. Today is about Going Green. Really, simply getting out and going! Springtime in The Bay is all about everything Blooming. So get out there and look for the wonders of nature coming to life. Something very ‘green’ may be your temptation today. 4. Coffee To Go 8 a.m.
Drop by Jack’s for coffee and a fresh, ready-made breakfast sandwich with his famous ‘made from scratch’ cinnamon rolls, and you’re on your way! 5a. Adventure Out: Four!! Grab Those Clubs 9 a.m. The greens are calling! 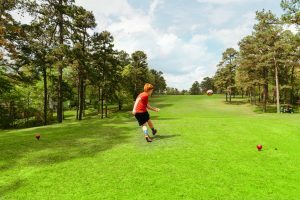 The Indian Hills Golf Course offers four sets of tees for players of all abilities to enjoy the natural surroundings, as they make their way around one of the best kept secrets for championship golf in Arkansas. Ask about the fun Foot Golf, where you play 9 holes with a soccer ball! If golf is your passion, have we got a green for you! Indian Hills Golf Course is carved into the hills and valleys of the Ozarks, offering some breathtaking views and challenging golf. Known by its tree-lined fairways, deep bunkers, small sloped greens, you can enjoy it on your own or join in with some of the local’s and learn more about the Bay as you play. The course is at its most beautiful in the Spring, with Dogwood and Red Bud trees and the flower beds bursting in color. Enjoy another look at the Indian Rock Cave as you pass down the 9th fairway. The signature 17th hole is as challenging as it is beautiful. A par 3 with a tee shot over the canyon: players must hit across a large ravine to an elevated green that slopes severely from back to front! 5b. Get Competitive! 9 a.m. Grab your tennis racket and enjoy one of our eight available courts (six of which are lit for nighttime play). Or try one of the fastest growing sports in the nation, pickleball. You can rent tennis and pickleball rackets at the recreation office. 6. Farm Fresh Food & Incredible Views 12 p.m.
Head over to the Little Red Bistro Bar at Indian Hills – favorited by the locals and awarded by Trip Advisor as a top pick. They offer amazing and reasonable daily lunch specials with only the best, tastiest in-season ingredients! 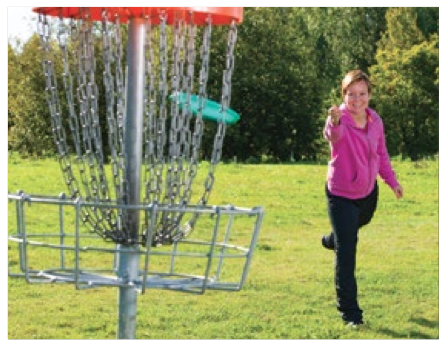 Try your hand at the 9-hole Disc Golf course in Woodland Mead Park. 7a. Adventure Out: Another Round – Golf of a Different Kind 1:30 p.m. Enjoy another round of golf, but change the course… and the game. Try your hand at the 9-Hole Disc Golf course located at Woodland Mead Park. See how the game changes when there are no clubs or balls involved, just flying discs and baskets for “holes”. If you insist on holding a club in your hand, our mini golf course is Harris Cup certified and will offer you a true test of your golfing skills. How many holes of golf can you play in a single day? 7b. Blossom In: Covered Bay Crusier! 1:30 p.m.
Take a cruise on the Newly Remodeled Belle of the Bay. A great family experience, the weekly cruises take you exploring around beautiful Greers Ferry Lake, in an enclosed and temperature controlled boat – offering perfect window viewing and an open deck. Enjoy the views of the varying shoreline; the beautiful homes perched in the trees. Watch for the Eagles as you traverse around Sugar Loaf Mountain, located right in the middle of the 40,000 acres Greers Ferry Lake. The Fairfield Bay Marina offers another large shopping area for souvenirs of all types. Be sure to enjoy the Fish Feeding Frenzy. More fun than you can imagine from a single bag of fish food. Oh, and be sure to get a souvenir picture in the Giant Fish Chair. 8. Tired Yet? You’ll never tire of this – Pizza Wings and Tacos 6 p.m. Hang out with locals, grab yourself a libation and swap stories of the day at Dock of the Bay. Great food and even better people await. Local music on Saturdays during the season. After dinner, check in to see if there is an outdoor concert scheduled at the amphitheater in Woodland Mead Park. There’s always something happening in the Bay. Is it time to relax yet? Sleep in today? Or get up to watch an Ozark sunrise! The choice is yours. After yesterday’s activity-filled itinerary, today you’ll wrap up your stay with relaxing activities before you bid a reluctant Farewell to The Bay. 9. Breakfast Biscuits 8 a.m.
Jack’s offers fresh made, home-style breakfasts that will bring you back every time you visit the Bay. Start the day with a smile! 10a. Morning Stretch 9 a.m. Stretch your legs with some fresh air on this short hike on Indian Falls Trail. At just under a mile in length, this moderate trail is a beautiful path along the rim of Wild Horse Canyon. With two rock formations and two waterfalls, it’s a bright way to start your day. The trail ends at Indian Falls, the larger of the two. Follow Dave Creek Parkway to the Methodist Church turn right on West Cliff Drive next to the church. You can see the trail entrance on the right after you pass Riverview Drive. Do be careful when the trail is wet and mindful that the trail does get close to the canyon’s edge in a few spots. 10b. Get Competitive! 9 a.m. Grab your tennis racket and enjoy one of our eight available courts. You may even find some locals you can challenge. 10c. Explore The Bay 9 a.m.
Save some time to wander by the unique Hippe Recycling Center, see the community vegetable gardens, get a few big tail wags and kisses at the local dog park and more. 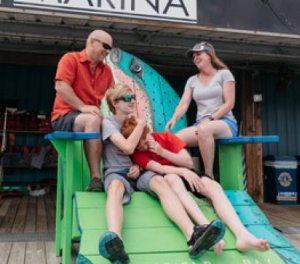 be sure to snap a pic at the Giant Fish Chair at the marina. Always remember you have a great BIG welcome waiting for you here. 11. Lunch & Farewell 12:30 p.m. Treat yourself to a gourmet burger for the road at Cool Pool Cafe, located at the BayView pool. Great food, fun loving staff, and a favorite with the locals. The view of the lake is spectacular here. Soak it in, and make a promise to return to the Bay soon. Always feeling like you are home is part of the Fairfield Bay charm. To take piece of that memory with you, be sure to stop for one last photo at the landmark “Giant Chairs.” The giant sh chair is at the marina, and the giant blue chairs are at the entrance inviting all who enter to sit a spell and stay awhile. Vow to return as soon as possible!